In his early life Sibelius was hugely patriotic. One of his earliest pieces (from 1893) was a 7-part collection of incidental music for a play put on by students in Karelia (the play was also patriotic). The different musical images depicted historical scenes from the Karelia area. Karelia is in the south-east of Finland, a beautiful wilderness full of history and peasant music (nowadays it's in dispute between Finland and Russia). Sibelius loved the area - he went there on his honeymoon and had traveled all around. 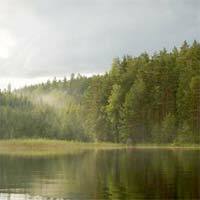 Later Sibelius took three of the pieces from his incidental music and jammed them together into an orchestral suite - the Karelia suite. At its premiere in 1896 it was a huge success, receiving a standing ovation from the exultant Finnish audience. It's become one of the composer's most popular early pieces. It's one of my favorites too - and Sibelius himself was very fond of it. Inspired by the rough, simple life of the Karelian people, Sibelius made this music folk-like and slightly rugged. He paints stark images of the landscape of Finland, but also injects the pieces with a sense of nationalistic pride. I really like the moods Sibelius captures in his suite. The music isn't very complicated, but the melodies and rich colors are so wonderful that you get absorbed by them. Intermezzo: This exciting piece depicts a procession of Karelian laborers paying taxes to a Lithuanian Prince. The music starts slowly in strings, conjuring up an image of vast snow tundras, before becoming more and more lively. The piece then calms down and returns to the opening mood. Ballade: This, my favorite movement, depicts a medieval Swedish king moodily listening to a singing bard in his castle. The music has melancholic feeling, and a sort of poignant nostalgia. The nostalgia isn't gooey though - it's full of pride and honor. Alla Marcia (March-like): A jolly piece which was originally intended to depict a violent city siege. For me though the music is too light and sunny. This is one happy army! Nevertheless, the music is still exciting and patriotic. First of all comes the recording conducted by Petri Sakari with the Iceland Symphony Orchestra. Sharing a similar climate and landscape with Finland, these Icelandic players capture the raw and passionate feelings of Sibelius's youth. Let me present Leif Segerstam, conducting the Helsinki Philharmonic on an Ondine release. This is perhaps the most suitable orchestra on the planet to record Sibelius - Finland's greatest musicians brought together under one baton. This recording is absolutely wonderful. The emotions, precision, shades and images are all perfect. These Finns give it their all, giving the recording a really powerful feeling of patriotic pride. (As a bonus the disc also comes with a great modern reading of the Sibelius Violin Concerto). You might also be interested in Sibelius's dramatic orchestral fairytale En Saga.